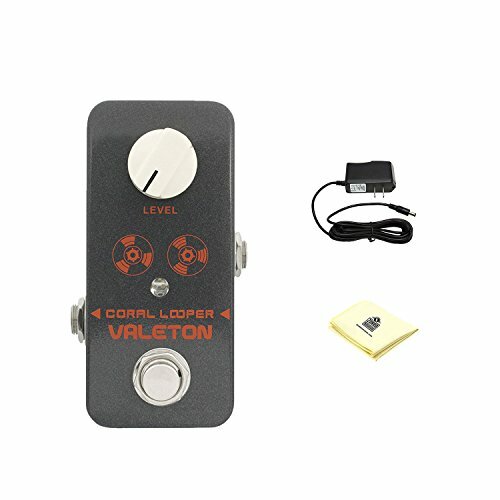 Level: controls the loop volume simple, easy-to-use looper pedal unlimited overdubs undo / redo function high quality recording and playback aluminum-alloy die cast casing to withstand wear and tear heavy duty metal footswitch and status LED low noise level.This is a simple, easy-to-use looper pedal.The function of the LEVEL knob is Controls the loop volume. Bundle includes ACE PP9V Pig Power 9V AC 1000mA Power Supply Don't let your power adapter hog up more than one space on your power strip! Pig Power is a 9V power supply with 1000 mA with a minimal design that requires just a single outlet.Bundle also included Zorro Sounds Custom Designed Instrument Cloth Keep dirt, grime and fingerprints off your equipment with custom designed polishing cloth. Plush and non-abrasive, this cloth will safely remove any impurity, so your instrument will shine as brightly as your rock star self.